Kermit the Frog began a globe-hopping tour to celebrate his 50th showbiz birthday Friday in this small West Texas town that shares the beloved amphibian's name. The town of about 5,700 rolled out the green carpet for the singing, dancing Muppet and former ”Sesame Street“ star, giving him the key to the city, dubbing him grand marshal of the homecoming parade and crowning him honorary homecoming king. Homecoming king, Kermit the Frog, celebrates with the cheerleaders from Kermit High School in Kermit, Texas. 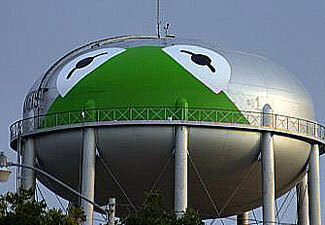 The town, one of two in the country named Kermit, also painted Kermit's face on the community's large water tower. The local Dairy Queen offered green French fries and ice cream in his honor. A park in town also will bear his name. Kermit's 50-stop tour will cross four continents and last until the end of 2006. Stops include the Statue of Liberty, the Eiffel Tower, the Great Wall of China, the Johnson Space Center and a courageous appearance at a Frog Leg Festival in Fellsmere, Fla. He's even scheduled to run with the bulls in Pamplona, Spain. The residents of Kermit, Texas, population 5714, painted the famous frog on their most prominent water tower. Kermit made his debut in a 1955 television comedy called ”Sam and Friends,“ which aired locally in Washington, D.C., but he looked more lizardlike then. Kermit was fashioned from an old coat belonging to the mother of late Muppets creator Jim Henson, who was born in Mississippi and named the frog after a childhood friend. Henson and his 2-foot tall puppet joined ”Sesame Street“ in 1969. ”The Muppet Show“ followed in 1976 and ended its run in 1982. Henson gave Kermit a voice and a life for 35 years, until his death in 1990. Since then, Steve Whitmire, who had worked with Henson for about 13 years, has taken over his voice and movements. Kermit offered insight into how he stays so youthful looking. 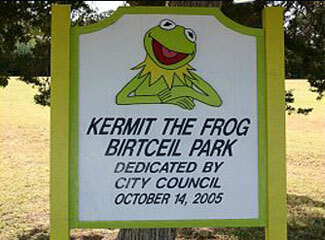 This local park was dedicated to Kermit, the world's most beloved frog. The town of Kermit, a ranching and oil area about 375 miles west of Dallas, was named for Kermit Roosevelt, the eldest son of President Theodore Roosevelt. He had visited a ranch in northern Winkler County to hunt a few months before the town was named. Kermit, which incorporated in 1938, began as a supply center for the area's scattered ranches. In 1926, oil was discovered near Kermit. The town experienced a boom and the population grew to more than 10,400 in the 1960s but has declined steadily since. As the price of oil has surged in the past year or so, the town's economy is steadily rebounding. But officials said Kermit's visit brought priceless publicity.